Celebrating the latest major price rally on XRP, and due to high demand, we are excited to announce immediate availability of XRP support of all Nano S and Blue units. If you do not have yet a Nano S or a Blue, you can order one on our online Ledger shop or through our resellers network (please note that the Blue is out of stock until end of July 2017). 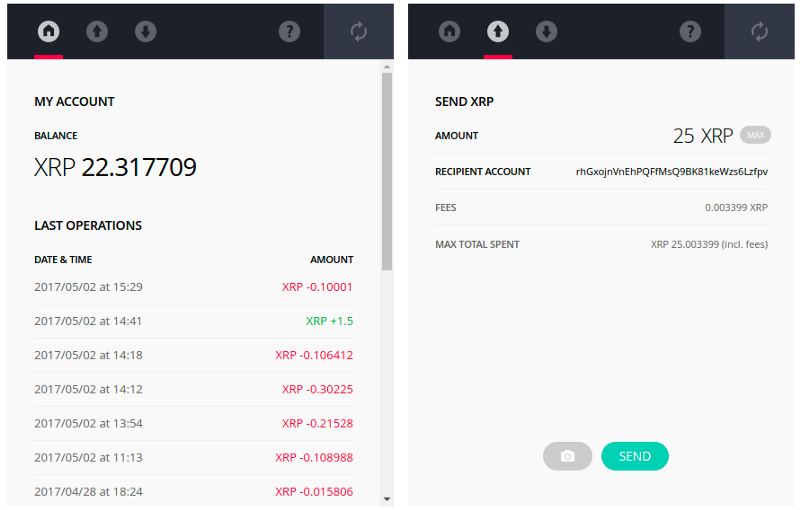 To add XRP support on your Ledger hardware wallet, you need to launch the Ledger Manager and install the XRP app on your device (as the maximum number of apps is limited by memory constrainsts, you may have to uninstall first another app). You must make sure that your Nano S has been updated to the latest 1.3.1 firmware. To manage your XRP wallet, you need to install the Ledger Wallet XRP app (compatible PC/Mac/Linux). It is a new and independant app, only dedicated to this crypto-currency. Make sure that your Nano S has the latest 1.3.1 firmware. To check, go to “Settings > Firmware”. Follow these steps if you need to upgrade. The Blue doesn’t require any specific firmware. Launch the Ledger Wallet Manager, select the Applications tabs, find the XRP app and install it by clicking on the small bottom arrow. If you are having an error, it’s most probably because your Nano S is full, you must then remove first an app. Close the Ledger Wallet Manager (it is important to habe only one Ledger app running on your computer at the same time). Go the the Ledger Wallet XRP app page and install the native app on your computer (compatible with Mac, PC or Linux). Launch the Ledger Wallet XRP app. Select the XRP app on your Nano S, press both buttons, and voilà! In case of loss of your Nano S or Blue, your 24 words backup will also recover your XRP wallet in a new Nano S or Blue. You do not need to backup anything else. We will soon provide the tools to export your XRP private key (from the 24 words) if you need an emergency recovery without a Ledger device. The Ledger Wallet XRP provides with only one address / account (exactly like the current Ledger Wallet Ethereum Chrome app). The structure of the XRP protocol makes that it is not possible to send less than 20 XRP on a new account, and you must also always have a minimum of 20 XRP on your account (if you have 1,000 XRP you’ll only be able to spend 980 XRP, a minimum 20 XRP will be locked to your account forever). With the addition of XRP, Ledger’s hardware wallets are now supporting 10 crypto-currencies: Bitcoin, Ethereum, Ethereum Classic, Dogecoin, Litecoin, Zcash, Dash, Stratis and Komodo. All ERC20 tokens (REP, GNO…) are also supported as well through the myetherwallet.com integration. You can monitor the future implementations in our roadmap. If you wish that Ledger adds support for your favorite coin or blockchain, we invite you to read our standard information on the subject.